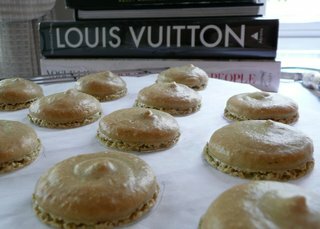 Last May I learned how to make French macarons, the delicate sandwich cookies that are mostly meringue and almond flour. The first attempt, while being a fun party as our friend Pat tried to teach us, didn’t turn out all that well. The second attempt was better and I made a funny video in the process. The third attempt this past Sunday finally encountered some success. This time I used a different recipe, one that does not involve making an Italian meringue and then folding it into the almond flour mixture. This helped a great deal because Italian meringues are a pain in the neck to make. As you can see from the uncooked macarons on the left, they were much thicker and didn’t spread. I attribute this to having left the egg whites in the refrigerator, uncovered, for two days before using them. This allowed more water to evaporate and allowed for a more substantial whipped egg whites. This means that the batter didn’t spread and so the cookies were thicker. The finished macarons, right, have the signature “foot” around the base, caused when they rise. This happened because I turned the air conditioning on well before starting baking, reducing the humidity in my condo. This allowed the batter surface to form a dry skin within an hour so as the cookie baked the solid surface lifted and created the foot. The other thing that turned out right: I let the cookies cool on the parchment. That way, the bottoms of the cookies, which are very delicate, didn’t crush and expose the semi-hollow interior. That’s another key step. They also had a nice sheen to them. I’m not sure what caused that – probably the drying before baking. 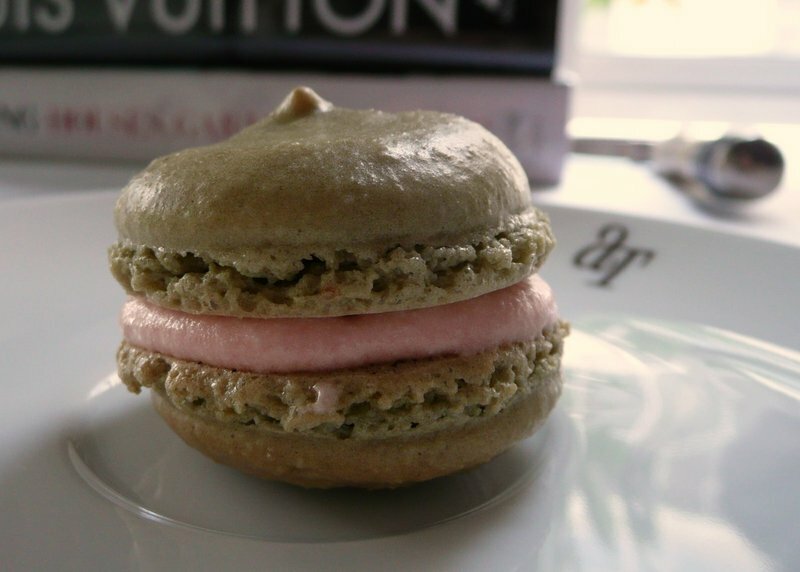 This is a green tea macaron (no artificial coloring) with a passion fruit buttercream filling (a little artificial coloring). The buttercream didn’t end up as thick as I’d like, so there’s still one more thing I have to master. Still, I’m glad I have found a less labor-intensive way to make these and have mastered them. This entry was posted in Uncategorized and tagged baking, cooking, food, macarons by christao408. Bookmark the permalink. YUM! xD tho they sound like alot of work. I love it when a “dish” finally comes together after multiple attempts. I think it’s the most satisfying thing; far more satisfying than one-shotting dishes. These look good. I think for attempt #4, you’ll have nearly perfected it.I’m curious — your oven, is it gas or electric? Green tea and passion fruit flavored? That sounds amazing! You are certainly a tenacious perfectionist! I would have said forget it and just paid the extra $ to go buy them. Though these do look tasty! Delicious! I love the color of the filling. How about making a batch for Valentine’s Day? @murisopsis – Oh, that’s the same conclusion I’ve reached but I have a large container of almond flour in the fridge that needs to be used up! @CurryPuffy – Good idea. That is this Saturday, right? @osmundaregalis – Oh, I’m sure you of all people would be fantastic with this! @TheCheshireGrins – It was a good combination. @arenadi – Fourth, fifty, sixth, sevent attempt… LOL Electric from SMEG. For a convection oven it seems to have hot spots. @ungrandvoyage – Give it a shot! @WilldrawsRainbows – This recipe was a lot more user-friendly than ones I’ve used before. @yang1815 – They were pretty cool. Those sandwich cookies look gooooood right about now. They look nice … funny enough, today we had Laduree macarroons at work as my boss brought some back from a trip to Paris. mum mum. i think i’m going to go for high tea soon. hehe. They look delicious! 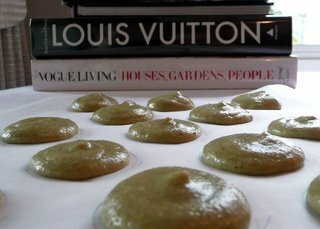 You make it seem relatively simple to make macarons. I fear that if I do make them, I will eat them ALL! So I stick to buying only 6 macarons at a time. I can honestly say I’ve never seen anything quitelike that here in the UK. What other flavours dothey come in when shop bought ? I don’t think Green Tea would be to my liking but I’d try anyfruit variety’s. wow, those look great! meringues are kind of a pain to work with, so i’m impressed! Your blog is too dangerous…..my mouth is watering and I want to eat one of those but will get a glass of water instead….and maybe a chocolate. I could use a bit of sugar right now… just before bedtime! Seriously, I think it’s great that you kept at it. Do you make notes on each attempt so you know what to tweak or change for the next attempt? Or maybe you have a great memory. @ElusiveWords – Well, I don’t make notes. And I don’t have a great memory, either. Which makes it quite a wonder that they get better each time. Luck, perhaps. @Gma_Joyce – Good for you – chocolate is full of antioxidants, right? @rudyhou – Well, the color matches in that it is a pale green. The brownish tint comes from the almond flour and the cooking. I could have added green food coloring I suppose. @christao408 – oh it was, she had mastered it. After she died, the family bought grandpa a electric stove because he didn’t know how to use the wooden one.